New England's superlative walk by the sea—the Cliff Walk in Newport, Rhode Island—allows you to traipse through the backyards of this historic city's spectacular mansions and private homes, admiring the ocean views that made this stretch of coast so alluring to America's rich and famous at the tail end of the 19th century. A stroll along this 3.5-mile pathway is a multi-sensory experience that is a must for Newport visitors in all but the most ferocious weather. You'll see architectural artistry that is only outdone by the majesty of the swirling Atlantic, which provides a soothing soundtrack for your stroll. During America's Gilded Age, just prior to the advent of the 20th century, the colonial city of Newport became a playground for wealthy families, who built opulent "cottages" along the shore, which they occupied chiefly during the sparkling summer season. Development of segments of what we now know as the Cliff Walk began around 1880. A path along the stretch of coast these castles overlook had been trodden for centuries, though, by the native Narragansetts and by European settlers. This continuous history of use helps to ensure access to the trail remains a public right even though the Cliff Walk crosses privately owned properties. The Army Corps of Engineers stepped in during the early 1970s to make the walkway, which suffered damage during New England's two most devastating hurricanes in 1938 and 1954, safe for public use. In 1975, the Cliff Walk was designated New England's first National Recreation Trail. The Cliff Walk's precarious oceanside location necessitates continual repairs and maintenance. It's an investment in what has long been the most popular attraction in this destination that has more to see and do than other cities its size. Newport's Cliff Walk begins at the western end of Easton's Beach at Memorial Boulevard and continues south with alternate entrance points at Narragansett Avenue, Webster Street, Sheppard Avenue, Ruggles Avenue, Marine Avenue, Ledge Road and Bellevue Avenue at the east end of Bailey's Beach. The northern half of the Cliff Walk is the easiest portion to navigate. The walkway is paved here, and sturdy fences protect you from taking a tumble as you walk along the oceanside cliffs. If you intend to go the entire 3.5-mile distance, though, be prepared with sturdy footwear, as conditions along the final mile or so of the trail are rough and much more challenging. Keep in mind that the seaside rocks you'll be crossing are particularly treacherous when wet. For safety, it is important to stay on the trail. As this map shows, RIPTA's Route 67 is your public transportation alternative to hiking the entire Cliff Walk in both directions, but you will still need to walk an additional distance to meet up with the bus. If you've parked at the Newport Gateway Visitors Center on America's Cup Avenue, the bus will return you to this central hub. You needn't worry about getting "lost" along Newport's Cliff Walk. Large signs indicate cross streets, which lead out to Bellevue Avenue, the main "mansion drag" in Newport. 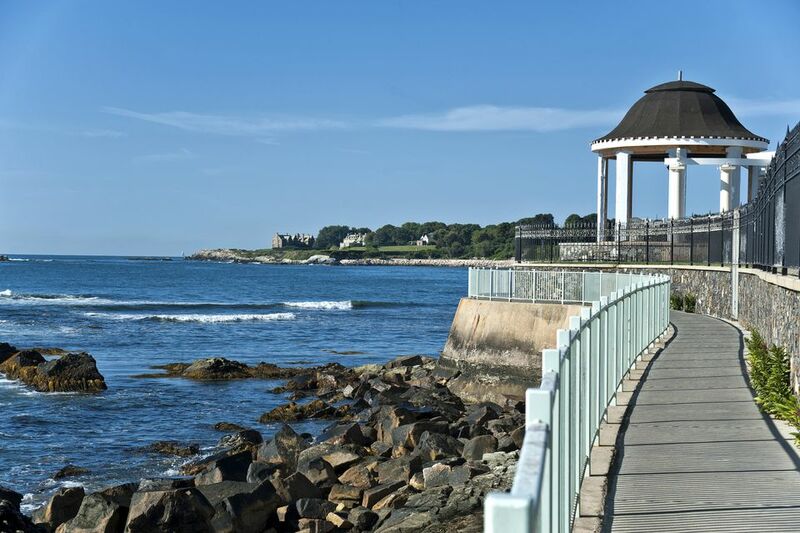 Newport's Cliff Walk is one of the most romantic walks in all of New England. It's a great spot for a marriage proposal. Even if you only walk a short segment of the Cliff Walk, you'll love this chance to admire coastal views that once enchanted America's elite families. One particularly lovely time to visit the Cliff Walk is during the Newport Daffodil Days Festival in the spring. More than one million daffodil bulbs have been planted along the Cliff Walk and throughout the city. The Forty Steps, a stone staircase leading down to the ocean. Ochre Court and other architecturally significant buildings on the 80-acre grounds of Salve Regina University: arguably the most scenically situated campus in New England. Dozens of private homes, plus several public mansions including Rosecliff and Rough Point. You'll even see the most magnificent and impressive mansion of all: The Breakers. This 70-room palazzo was designed by Richard Morris Hunt for Commodore Cornelius Vanderbilt. This Cliff Walk map makes it easy to find attractions along the route. When is the Cliff Walk Open? You can visit the Cliff Walk any day of the year between sunrise and sunset. Use common sense, and skip the Cliff Walk if the weather is rainy, icy, or bitterly cold. Is there a fee? No, the Cliff Walk is one of New England's best free attractions. Is the Cliff Walk wheelchair and stroller accessible? The northern, beginning stretch of the Cliff Walk is wide and paved, so it is the most accessible segment of the trail and definitely doable with a stroller. It is not flat, however, and parking limitations mean the Cliff Walk is not very handicapped accessible. Are dogs allowed on the Cliff Walk? Yes, but they must be leashed at all times. Can you bike the Cliff Walk? No, bicycles are prohibited. Are there restrooms along the Cliff Walk? Use the restroom facilities at Easton's Beach before setting out on your trek. There are no other permanent public restroom facilities along the Cliff Walk. Which hotels and inns offer the best Cliff Walk access? Your two best bets are The Chanler at Cliff Walk and Cliffside Inn.